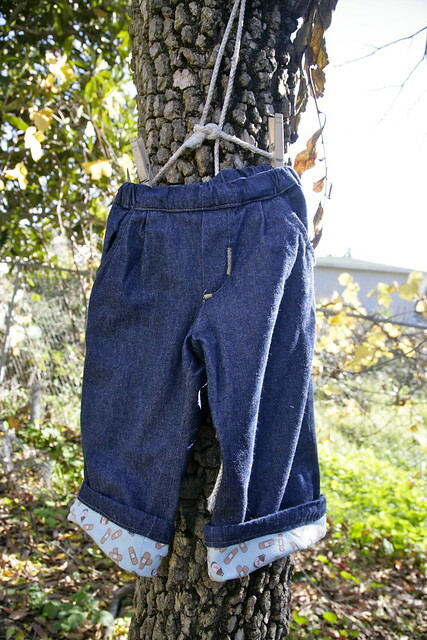 Inder Loves Folk Art: Old Man Jeans, with Photos. 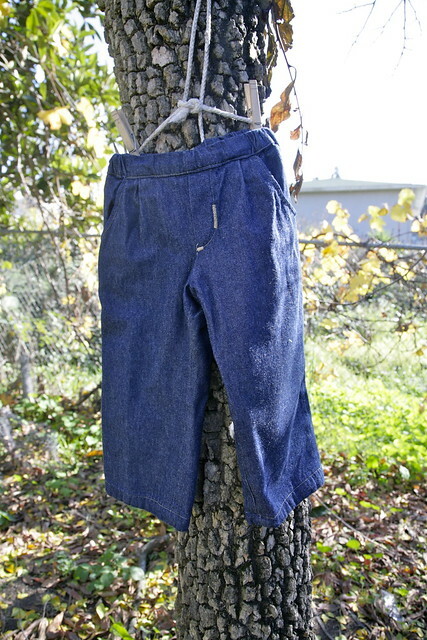 As promised, here are Joe's new "old man jeans." Old man because they are high-waisted, elastic-waisted, pleated, and bright blue! Here they are cuffed (they're pretty long on Joe - an accomplishment these days, when Joe seems to grow a half inch between cutting and sewing) so you can see that they are fully lined. In band-aid flannel. An appropriate choice for my little bruiser (who doesn't use that many bandages, because honestly, most cuts don't even slow him down for a minute!). I used to the Oliver + s Sketchbook Shorts pattern (of course), lengthened into pants. This was my first time lining them, and it was really easy. For the lining pieces I removed the details like pockets and fake fly. After sewing the legs and crotch seam, I basted the lining fabric to the outside fabric at the waist and then added the waistband. 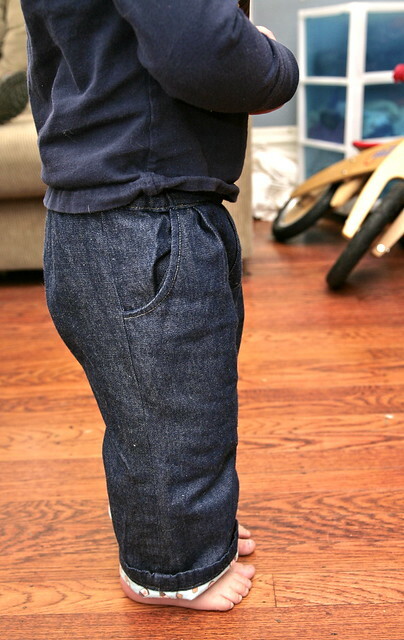 I folded up the denim for the hem. Here's a detail of the fly. I tried the bar tack technique outlined in Sewing For Boys. I like it, although it does not mitigate the old man thing at all. And here's a detail of the cuffs, so you can see the lining fabric. This bandage fabric was part of one of the sock monkey flannel lines, I believe. Last, and probably least (it is so hard to get Joe to pose for photos these days! ), Joe wearing the pants and relaxing on the couch. And here's the side view. They don't look as old man on Joe as they do on the hanger. But I still think he needs a Fred Rogers cardigan to complement these. I have a bunch of other projects just waiting for the sewing mood to strike. Check out this pile! 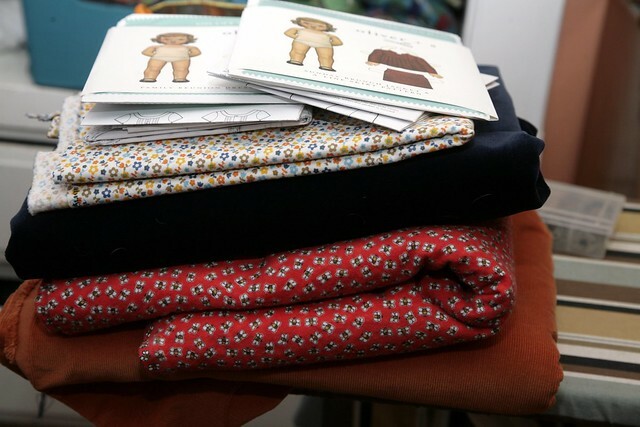 I bought a couple new Oliver + s patterns for Christmas presents for some of the little girls in my life, and I'm excited to get started on them, and trying not to think about how unrealistic my holiday sewing list is this year. That's orange corduroy on the bottom of that pile. And red flannel with bees, and blue velveteen, and a soft organic ditzy floral on top. So much sewing to do! So little time! You find the neatest fabrics... I just love the bandaids. 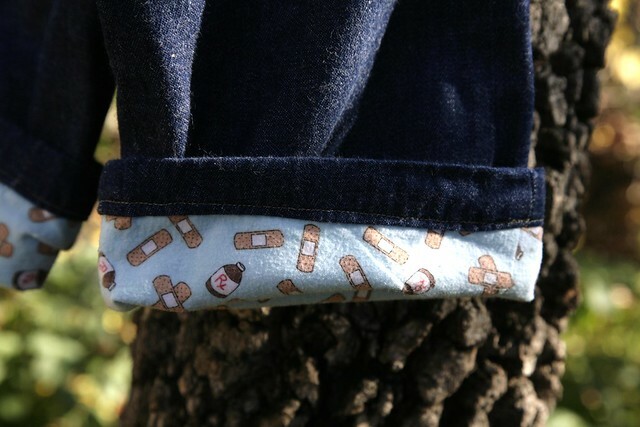 Joe looks great, old man or no :) Cute jeans, the bandaids are such a great choice for a lining. Can't wait to see what you do with your next projects! I lined some with fleece last year for my ''little'' boy. They kept him very snug rock climbing! 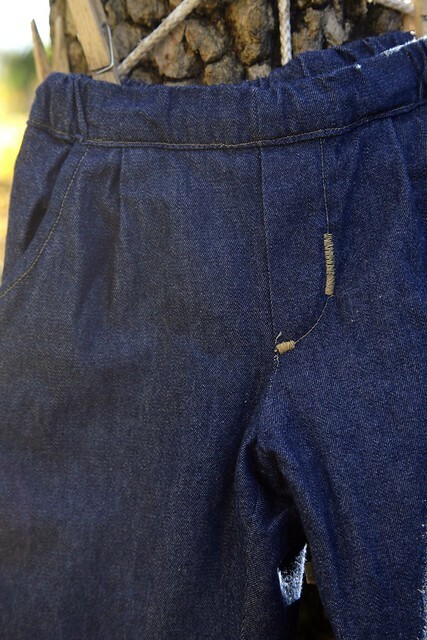 Teehee - I think it's the dark denim, made in that pattern that does the old man thing. I can't quite put my finger on why. Possibly that 'trying to look casual but I only wear these on Saturdays so they're still pristine and probably ironed' look. The bar tack detail looks fab! And I'm sure they feel waaaay nicer than old man jeans to wear because of the snuggly lining. I should have pressed them with creases down the front! Of course!! Those pants actually look amazing. I love the detail on the fly and super-soft flannel lining. They are going to be perfect for winter!